When you are tired of the typical vacation visiting past cultural relics and have been to every continent, where else is there for you to go? With new breakthroughs in space exploration and space tourism, you can journey into space and catch a glimpse of what future society will be like. Space tourism has become a new craze that is taking our previous notions of space travel to the next level. Over the past few years, there has been a boom in space exploration with the goal to give everyday people the ability to travel into space and experience what seemed to be impossible only years ago. In 2001, the first “fee-paying” space tourist visited the International Space Station for seven days. Two other tourists followed before the new fad slowed because of the Columbia disaster. In 2006, space tourism resumed. To date, there have only been six tourists to visit the International Space Station. The cost of these journeys is roughly $20 million, and is therefore, still limiting the possibility of space travel for the majority of the human race. Another popular type of space tourism that several companies are pursuing is suborbital flights. Companies such as Virgin Galactic are proposing these suborbital flights in which passengers will experience weightlessness for about five minutes and will witness the curvature of the earth as well as the surrounding star field. In 2004, Virgin Galactic funded Burt Rutan to build “SpaceShipOne,” which won the $10,000,000 X Prize. Today, Virgin Galactic is one of the leading potential space tourism companies. Currently accepting reservations for their journeys into space, Virgin Galactic will start its main flights in 2009, being the first private space tourism company to regularly send civilians into outer space. With a 3-day training process before the launch and a cost of $200,000 each, up to six passengers at a time will soar into the unknown for 2.5 hours at speeds up to Mach 3. With the revolutionary engineering and success of the SpaceShipOne, Virgin Galactic looked once more to Burt Rutan to design SpaceShipTwo, which would carry its new passengers. 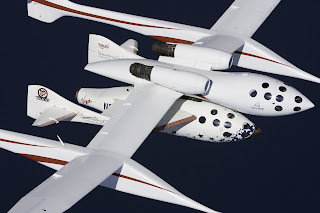 SpaceShipTwo’s unique technology overcomes the safety and cost issues that, until this point, restricted an everyday person to travel into space. Rather than launching from the ground, the spaceship is attached to a mother ship, which releases the spacecraft at around 50,000ft. Here, the spaceship fires rockets and, in mere seconds, accelerates to over three times the speed of sound. With revolutionary engineering, the spaceship’s feathered wings allow for a successful re-entry. These wings fold or feather, acting as air breaks, positioning and decelerating the spacecraft. At around 60,000ft, the spaceship’s wings assume their original position. This allows for a glide landing back on Earth. This improvement in SpaceShipTwo’s design removes previous risks that occurred during re-entry of previous flights. With new safety features, and a much cheaper cost, Virgin Galactic seems ahead of the game! As flights begin in 2009, they will take place once a week. However, as the progression of Virgin Galactic continues, there will eventually be two flights per day. With such revolutions in space travel, the future is upon us. Book your flight today and experience the unknown! 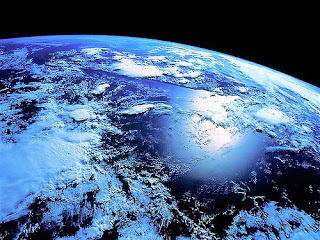 Space Future –Space Tourism. Sam Coniglio. 2008. 29 Nov 2008. .
Space Tourism and Tourists. 2006-2007. 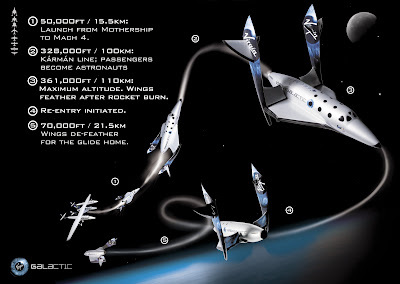 29 Nov 2008. .
Virgin Galactic. 2008. 29 Nov 2008.